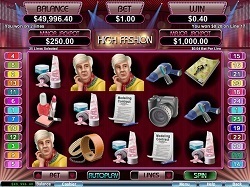 New Game High Fashion at Sloto'Cash! Reserve a front row seat for High Fashion, the stylish new 25-line slot from Sloto'Cash! Show off your best Blue Steel pose in this glamorous slot, with two different features to enjoy! Scattered Runways and Doubling Wilds trigger the free games, and during each feature spin at least one entire reel will be composed of Wild symbols. Strut your stuff and stay tuned for High Fashion Freespins and bonuses on September 17th!